Gymniks Gymnastics offers 3 seperate gyms to fullfill the needs of all of our athletes. First is a 5,000 + sq. ft. gymnastics training facility with top of the line equipment, which is continually upgraded to meet and exceed USA Gymnastics requirements and guidelines. 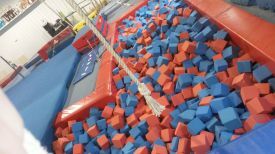 This facility features in-ground and above ground resi-pits, a loose foam pit, 42ft x 42ft palmer power spring floor, AAI Elite bar and beam equipment, and a wide variety of other training equipment. We also offer a third 5000 sq. ft. tumbling and cheer training facility with 2400+ sq. ft. of top of the line spring floor, 40 ft. Tumble Trak, and 40 ft. rod floor. This location is where most of our tumbling classes are offered. We also provide special sessions for school or recreational cheer teams to train. Instruction is provided or just the space for teams needing a place to practice. Contact the gym for more information.